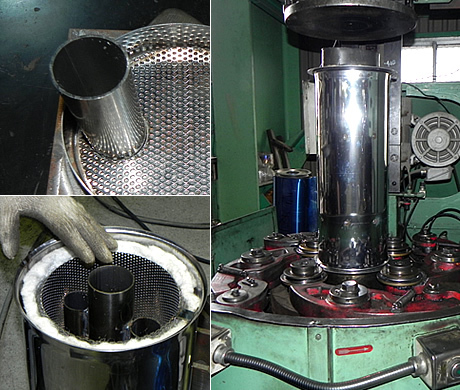 To seam the circumference welding part with a special machine, we can finish making the stable quality and in short time. Also we can provide our products with cost down in cheap price to our customers. We correspond to meet our various customers demand by using various pressing equipment and mold machines in our company. We perform the highly precise products for our customers. We utilize the latest 3D CAD system and the high processing machines with data makings and to correspond to products with the complicated shapes. These total technologies are one of our company's charms and evaluated by our customers. According to a different type of vehicle, we design and develop the best layout for our products mixed with good looking and specialized design. Also we can manufacture the products in sequenced bend pipes or joint pipes with high quality welding depending on our customer's request. In our facility, we are able to weld a sort of stainless steel, aluminum and titanium and etc with the rich welding machines. All staffs are well skilled masteries so we can realize our products in beautiful finish welding. Sometimes we stop the manufacturing even on progress, and we judge and proceed with the right operation method depending on stand or situation. This makes we can provide the best products for our customers always based on a point of customer's view to us. In design data, we use the latest 3 dimensional CAD system and draw the data by ourselves to adopt our customer's request by controlled our computer and enable to bend from 38mm to 90mm pipes precisely. So we can manufacture the complex shape products in high quality level. We accept any kind of demands from our customers with our various press processing machines and mould machines. Especially our mould machine can be designed and make a mould for our customer's request by our own facility. This makes a total cost for manufacturing the products. 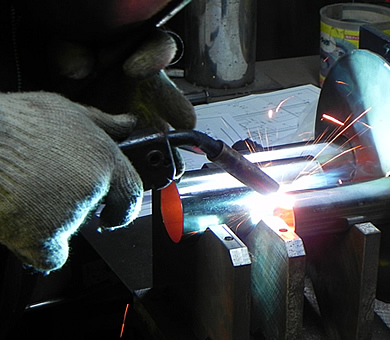 Also we process the pipes in precise cut with wire-cut machines and plasma cut machines. All staffs are well skilled masteries so we can realize our products in beautiful finish welding. Sometimes we stop the manufacturing even on progress, and we judge and proceed with the right operation method depending on stand or situation. This makes we can provide the best products for our customers always based on a point of customer's view to us to perform our best efforts to provide our products to our customers.